CCAS meetings are free, friendly and informal. Members sometimes share photos and information on all kinds of subjects. We usually have special guest speakers and presentations on events that are open to everyone. We also partner with Cal Poly, Cuesta College, and other scientists in the field, so there can be an interesting variation of discussion topics, sometimes very light in content and sometimes moderately heavy in technical information. Everyone is welcome and encouraged to attend. You do not need to be a CCAS member to attend meetings. Folks are welcome to bring astronomy equipment, books and photos to share with the group. 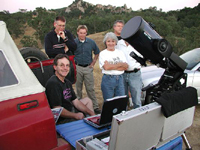 We also like to assist in answering questions or help with equipment operation techniques when needed, and its usually best if you have telescope questions to bring your scope to a star party before sunset. That way, our friendly astronomers can assist you on the spot and help you learn how to operate it safely. Meetings are held on the 4th Thursday of each month, except during the summer and holiday seasons. Click here for meeting time, date, and location information.